It was in Latin America where we discovered how much we didn't know about street art. In Chile, Uruguay, Argentina and Brazil, there was a thriving scene, but it was Colombia's where the quality and scale of the medium was most visible. The cities of Cartagena, Medellin and Bogota were a canvas for local and international street artists; large scale murals outnumbered billboard advertisements and were often of an artistry which we had never seen, or perhaps never appreciated, before. It was clear that this was an art form, and a global movement, which we had been quite oblivious too and that there was so so much more to it than Banksy. And so, after learning how pivotal and diverse street art actually is globally, a tour with Urban Adventures through Camden, one of London's most well-known areas, with a key figure in the local art community was the perfect chance to understand its role in the UK, as well as discovering some fantastic examples of the beauty that can be found amongst cracked pavements and dirty walls. On a brisk autumnal Saturday morning, we joined our guide, Nelly, who is also a key facilitator for international street artists to find walls and materials or support for their craft. Now, the team at Along Dusty Roads aren't huge fans of Camden; it's not too bad an area, but there are many neighbourhoods of London which we would much rather spend time in. However, within the first five minutes, it was clear that this wasn't simply going to be a conventional journey through the market and some of the well-known, well-trodden sites. Instead, this was to be a walk through back streets and hidden alleyways hitherto unknown to us. Now, as we mentioned before, everyone and their grandmother knows who Banksy is. However, what this tour made us aware of is that that's basically the equivalent of, when discussing 'actors and actresses', everyone only knowing Brad Pitt and nobody else. It turns out that, although Bristol's finest is certainly the headline act, there are actually a large number of prominent figures in the community whose work adorns walls across several continents and is highly in demand. Many remain anonymous - à la Banksy - with their mystery increasing interest and, ostensibly, the value of their work. However, each has a style and signature which makes those in the know able to distinguish them as easily as The Beatles and the Spice Girls. For example, this fantastic piece by JXC - measuring at least 8 square metres on the side of a pub wall - is so exceptional in technique and execution that it left us stunned. Fans of the Goonies will appreciate this work on that level but, for us, we simply could not fathom the amount of skill which had gone into creating such a photographic piece with SPRAY PAINT! Nelly, as well as providing context and back-story to each piece of work, also bust a few myths and misconceptions we had about street art. Firstly, we had basically always assumed that 'graffiti' was the term to refer to crap street art (the sort that feels like vandalism rather than any statement or skill). However, that is most definitely not the case. Although both share a high degree of similarities in key aspects, they differ in "technique, function and intent". Additionally, the problem of 'territorial tagging', where excellent works are sprayed over or altered by third parties, was explained in a way which showed that it isn't as simple as vandalism or destruction in some cases (although sometimes it really is just that). As well a bringing us to pieces we would never have discovered on our own - with a surprisingly high number of South American artists on show - the tour doubled up as a way to familiarise ourselves a little more with the Camden Town away from the main market street which is filled with its fair share of tat shops and rebellious teenagers seeking out any number of ways to annoy their parents. It also showed the importance having an expert local show you around and share their secrets. Towards the end of the tour, before we all settled down for a pint at Amy Winehouse's former local, Nelly brought us to an excellent piece by Dale Grimshaw, a highly realistic portrait titled 'Free West Papua'. Our group were all struck by the artistry, and she told us about a more recent piece Grimshaw had done in Shoreditch. With a small image on her phone, she mentioned that it was one of the most impressive projects she had seen in a long time but that it was going to be painted over in a couple of weeks. We couldn't understand it - why would anyone allow such a thing of beauty to simply be removed? 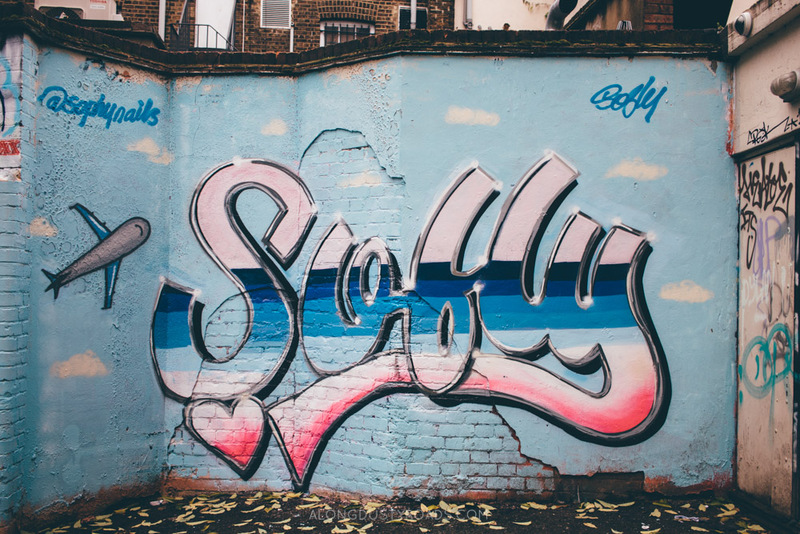 However, as she explained, a core tenet of street art, versus traditional 'gallery' art, is that it is 'permanently temporary' and that, whether it is a local council, a tagger, an annoyed homeowner or another street artist, a work is never going to remain in the same untouched state forever. That simply isn't what happens when your gallery is free, open and accessible for all; when the street is your canvas. Despite living only a short bus ride away from the piece's location, neither of us had been aware of it until then. However, we knew straight away that, the every next morning, we had to seek it out before it was replaced and gone forever. We were on the Camden Art Crawl tour by Urban Adventures, who offer a selection of unique, local-led tours and experiences all over the world to show a different side to a destination. We have a 20% discount offer for any reader booking a tour with Urban Adventures - just enter the promo code 'BGANDREW' at the final payment stage on their website.